Sometimes the old is fresher than the self-consiously new. “We were one of the very first bands that dared include a traditional song in their album to not have stones thrown at us for this”. Kristi Stassinopoulou and Stathis Kalyviotis, No 1 for months on the World Music Charts Europe with their new Riverboat album Greekadelia, are in my kitchen remembering the time when it started to become less physically hazardous to play folk music in Greece. It’s not that the music was bad, but that traditional songs were used by the junta to stoke up nationalistic fervour, presumambly inviting stone throwing by those of a leftish presuasion. But if the music contained modern elements, perhaps involving electricity,then the stone chucking would also hail from those on the right. Either way, it didn’t look good for musicians. Stassinopoulou and Kalyviotis were shining lights in a movement afoot in the early ’90s to reclaim folk music for the young, for hte left. Although they had met at the fag-end of hte ’80s, this time really marked the start of her and Kalyviotis’ missile free, folk-rooted and prodigious musical collaboration. 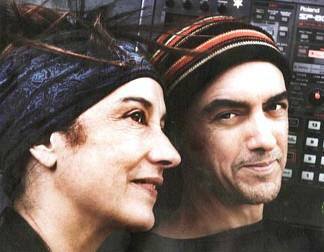 And now Greekadelia comes stuffed full of gems of Greek traditional songs performed in a the couple’s immitable style. It marks a change for them, not just because the recordings are not of their own compositions; they are the result of the pair working together as a duo and a move away from the bigger band sound that has typified their output for many years. And so, on returning to Greece, they both threw themselves into extensive research, unearthing songs from the rural areas of the Greek mainland and its islands. The prodigious archive of enthomusicologist and folk singer Domna Samiou proved a valuable source of information and Stassinopoulou acknowleges that without her work, many songs would have been lost. A student of the conservative musicologist and Byzantine music scholar Simon Karas, Samiou (wose death this year aged 82 sparked national mourning) was hugely influential in Greece as a singer and teacher, working tirelessly like Karas to preserve the old traditions. Her thorough conservatism, though not as strickt as her mentor’s was softened through her work with the man generally referred to as ‘the Greek Dylan’, singer-songwriter Dionysis Savvopoulos. 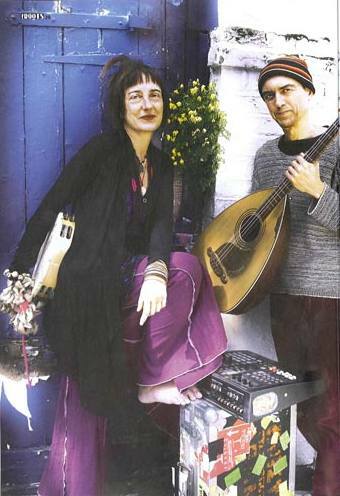 Inspired by Fairport Convention and of course Dylan himself, Dionysis was the first Greek musician “to combine a rock band with traditional instruments and traditional rhythms”. Inviting Samiou to sing with him, he introduced her to the burgeoning underground alternative audience emerging through the Athens club scene in the mid ’70s, directly after the fall of the junta. This began to popularise traditional music amongst the left-inclined young, starting the long slog of wrenching the music away from its purely right-wing associations. Sadly this proved a false dawn for an attempt on the music’s de-politicisation as the movement was suppressed immediately, not to re-emerge for another 20 years – at the time when Kalyviotis and Stassinopoulou happily discovered that playing traditional music was not an excuse for a stoning. When musicians turn to the traditional songs of their homeland, as these two are doing, it’s easy to assume their musical activities are fuelled by looking back in search of their roots. Kalyviotis is having none of it. Unlike their personal relationship, Selana was fairly short-lived as Kalyviotis and Stassinopoulou decided to work together on her solo albums, typically featuring his musical arrangements set to her lyrics, and down the years various combinations of musical friends and collaborators forming her band. Presumably this feeling was why the Colonels found that tying traditional music and dance to their cause was so useful. But for Stassinopoulou, discovering that she was moved in the same way by folk, church music and the songs of the Velvet Underground, the political associations grated. They formed barriers that she wants to see abolished. Kato Sta Dasia Platania features on Greekadelia with other rare songs from specific places. The not so rare also get a look in. Halassia Mou popularised in the ’50s is now so famous, says Stassinopoulou, that it can no longer be considered local. But whatever their provenance, all the songs on the album benefit not just from Kalyviotis’s multi-instrumental virtuosity but his brilliance with new technology. Using tape loops and found sound, he captures the atmosphere of the songs and the sounds of the traditional instruments. He eschews the depressingly popular use of electric guitars to mimic clarinet solos which only ever makes the songs louder and kitsch (though not in a good way). 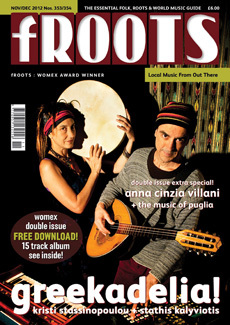 Both Kalyviotis and Stassinopoulou, whilst keen to show respect for the songs, are not of the view that it’s particularly useful to try and perform the music in the way that it was played centuries ago: pointless, in fact, thinks Stassinopoulou, given that no-one now can really know how it was played then anyway. But whilst the music is given a modern twist, the poetry of the old lyrics is as moving and relevant today as when it was written. The writing style attracts Kalyviotis, he says, because it’s a poetry that only people that are close to nature can display. For Stassinopoulou it brings back childhood emotion. The songs transport her back to favourite scenes, such as tiny white chapels seen from the sea, dotting the islands as they perch in the cliffs. For her, the words are returning to natural things, taking care of what nature is telling you. They bring me close to something that is getting lost, something unique.” And she is notjust talking personally. Life in Athens now, they tell me, “is indeed very rocky, very heavy, the last years like a dark, black cloud and it’s difficult to get to the truth of what’s going on.” The depression and anger and feeling of no-hope swirling around them have sharpened their focus on music. They want to spread a little joy. Although the recent gig season was one of the poorest they’ve ever endured, one of the good things to come out of the crisis, they say, is the work that musicians are now producing. For Stassinopoulou and Kalyviotis, this “was the most moving thing. it was the thing that made us say ‘OK let’s go on with this,’ because we were wondering whether we should or shouldn’t go on with this album.” Funnily enough they experienced similar doubt when working on their other World Music Chart Europe N0 1 album, 2002′s The Secrets Of The Rocks. For that particular release seeing the light of day we have to thank their farsighted friend and early manager Thalia lakovidou, who sadly died in 2004. Now for their latest album we should be grateful to Yannis’s mum who also told him: “They’re doing what they should be doing to make young people go back to these songs.” It’s what Stassinopouiou and Kalyviotis are aiming for. And if their modern take on the old songs can show people that singing in their own language does not necessarily indicate rabid right-wing conservatism, then Greekadelia is really a freedom cry for Greek folk music. And it makes you dance!